This story was written by John Sullivan, with reporting by Derek Hawkins, Kate McCormick, Ashley Balcerzak and Wesley Lowery. Pamela Anderson, mother of James Anderson, at her home in Chicago. James Anderson, who was mentally disturbed, was killed last year by a Chicago police officer after his mother called 911 to have him removed from her house. Pamela Anderson recently filed a wrongful-death lawsuit against the city and the police officers involved. One evening last September, Pamela Anderson's 33-year-old son was threatening her and needed to go to the hospital for medication to control his schizophrenia. She called police to her apartment on Chicago's West Side, as she'd done many times before. Her previous calls had ended peacefully. But that night, an officer shot and killed James in front of her, saying he lunged at police with a box cutter. 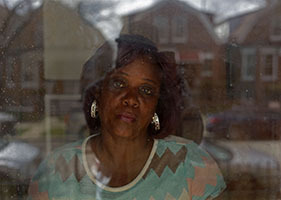 Anderson remembers the face of the Chicago police officer who killed her son. But she doesn't know his name. The department won't identify him or the officers involved in eight other fatal shootings in 2015, saying an agreement with the police union prevents the disclosures. "I need to know," Anderson said. "If he's got any kind of heart, he's got to feel the pain I feel." Nationwide, 210 people were fatally shot last year by police officers who have not been publicly identified by their departments. In 2015, police in the United States shot and killed 990 people, according to a Washington Post database of fatal police shootings. The vast majority of those killed by police were armed with guns or had attacked or threatened officers or civilians. The Post is continuing to track fatal shootings in 2016, recording more than 250 through March. The Post is also filing open-records requests seeking additional information about each shooting, including information about the officers involved, data that is not tracked by any federal agency. For 2015, reporters obtained the names of officers responsible for 780 of the 990 shootings. In about 600 shootings, officers' names were disclosed by police departments in news reports. In a handful of cases, names came to light through lawsuits or leaks to the news media. Where the names remained unknown, The Post contacted the departments and requested the officers' identities. In 145 fatal shootings, the departments declined to release the names to The Post, citing pending investigations, state or federal records laws, agreements with police unions or department policies. In another 65 fatal shootings, the departmentS did not respond to multiple requests for information. Since a grand jury in Missouri declined to indict Ferguson police officer Darren Wilson in the fatal shooting of Michael Brown in 2014, the public has demanded more accountability and transparency from police. Knowing an officer's name, for example, may reveal whether that officer has been involved in prior shootings or has been sued over the use of force. About this story: As part of The Washington Post's 2015 effort to tally police shootings, researchers and reporters tracked the names of officers as they appeared in news reports. If the officers' names had not been made public, reporters called police departments to request the names. Departments were contacted in nearly 400 of the 990 fatal police shootings last year. Shootings sometimes involved multiple officers. Only shootings in which no officers' names were released were counted as undisclosed. If a department declined to release an officer's name but the identity was publicized through other avenues, The Post considered it disclosed. The Post received no response from departments in 68 fatal shootings. Reporters contacted those departments at least three times over several weeks. For shootings in 2016, The Post is filing open-records requests with each department involved, seeking a range of information about the officers and circumstances. Read more in The Washington Post. Last year, after reviewing fatal shootings by Philadelphia police, the Department of Justice urged departments to release information on critical incidents, including shootings, within 72 hours. The Justice Department report said public mistrust was partly due to the police department's "lack of transparency" in officer-involved shootings. A presidential task force last year also said that "agencies should communicate with citizens and the media swiftly, openly, and neutrally" about serious incidents. Neither report specified that officers' names should be released, but officials involved said that the intent of both reports is that departments disclose them. Some police officials argue that officers' names should be withheld until investigations into shootings have been completed. Among departments that declined to release officers' names, pending investigations were the most commonly cited reason, accounting for about 60 fatal shootings. Other departments said the names should never be released. In 22 shootings, departments said their policies prevented public disclosure. In an additional 17 killings, police officials said they release the names only if the officers are criminally charged. In 14 fatal shootings, police officials said that releasing the names would endanger their officers. In 32 other shootings, departments gave a range of reasons for not disclosing the names, including that they were not subject to public-records laws. Policing experts say there is little consensus among departments on the release of information after an officer fatally shoots someone while on duty. Nearly 700 departments had fatal shootings by officers in 2015, a small portion of the more than 18,000 agencies nationwide. "I think police chiefs and departments have a wide variety of responses, and we have not found any model policies or standards," said Chuck Wexler, executive director of the Police Executive Research Forum, which advises police chiefs around the country on policy issues. In Chicago, the department releases the names of officers only if they are charged criminally in shootings, a concession the city's police union negotiated more than two decades ago. Similar rules apply in states such as New Jersey. In the District of Columbia, the Metropolitan Police Department said its practice is to withhold the name of anyone involved in a shooting by police, including witnesses or victims. The only time a name is released is if that person is charged with a crime or is deceased, police said. Federal agencies, whose officers killed 33 people last year, say they are prohibited by the federal Privacy Act from releasing the name of any agent unless that person has been charged with a crime. In California, the courts have ruled that officers' names are public record except where there have been threats against departments or officers. "The name creates that true accountability," said Sheriff Joseph Lombardo of the Las Vegas Metropolitan Police Department,which for decades has publicly identified officers involved in all shootings. "Once the name is put to the person or the act,it's very hard for an organization to avoid the tough questions about that individual's past." Police chiefs who favor disclosure have faced a backlash from police unions, which have increasingly appealed to lawmakers to prohibit or delay the public release of the names of officers involved in shootings. In a handful of states, the tension has pitted the public, police and state lawmakers against one another in a struggle to pry loose the officers' names or keep them secret. The release of officers' names is typically governed by state open-records laws. The laws in most states give departments wide discretion to withhold information for a variety of reasons, including exemptions for material used in investigations and restrictions on releasing personnel records. In Oregon, lawmakers in the state House in February passed a bill that would have allowed police departments to withhold for 90 days the names of officers who have received threats. The bill, which stalled in a state Senate committee, was proposed after a bounty was posted online for the state trooper who in January killed Robert "LaVoy" Finicum, 54, a leader of the group of anti-government activists who occupied buildings at the remote Malheur National Wildlife Refuge at the start of the year. The author of the proposal, a 31-year police veteran turned legislator, said the law was designed to be used sparingly. "I can't think of a single instance in my time as a cop where I would have used this," said Jeff Barker, a Democrat from Aloha, Ore. In Phoenix, police unions objected when the department there released the name of the officer who fatally shot Rumain Brisbon, 34, in December 2014. Officer Mark Rine said he thought Brisbon was holding a gun, but the object turned out to be a pill bottle, according to police. After the department identified the officer, the Arizona Police Association, a trade group for police, pushed a bill that would have required police departments to wait 90 days before identifying an officer involved in a shooting. A version of the legislation passed in the state House but was vetoed by Arizona Gov. Doug Ducey (R) in March 2015. Ducey said he was swayed by police chiefs who said they wanted to be able to name officers more quickly to address public demands for transparency. Rine could not be reached for comment. In February, state lawmakers in Virginia defeated a bill that would have made the names of all police officers exempt in all circumstances from disclosure under the state's public-records law. Some lawmakers and police union officials had argued that the dangers officers faced from the release of their names outweighed the public's right to know. "The culture is not one of respect for law enforcement anymore. It's really, 'How, how can we get these guys? What can we do?' . . . Police officers are much more in jeopardy. There's no nefarious intent behind the bill," State Sen. John A. Cosgrove Jr. (R-Chesapeake), who sponsored the bill, told The Post in February. The battle over names is also playing out in Pennsylvania, where then-Philadelphia Police Commissioner Charles H. Ramsey decided last July to begin identifying any officers involved in shootings within 72 hours. "It tells the public you have nothing to hide," said Ramsey, who served as deputy superintendent in Chicago, and police chief in the District before taking over in Philadelphia. "When you're reluctant to release the names, it builds mistrust." Ramsey, who retired last year, has been on both sides of the disclosure debate over a long career. He said his views evolved while he was chairing President Obama's task force on policing and heard citizens talk about high-profile shootings by police. But just hours after Ramsey announced that he would follow the task force's recommendation to quickly release officers' names in his own city, the local police labor union, the Fraternal Order of Police Lodge 5, filed an unfair-labor-practice charge, saying that Ramsey had made the change without negotiating with the union. The matter is pending. The union went further, pushing a bill on the issue in the state legislature. The proposal would bar the release of officers' names unless they are criminally charged in shootings or if the release of the information would put the officers or their families at risk. The bill passed the House in November but is stuck in a Senate committee. Union officials declined to comment. Ramsey, who as a young police officer shot and killed a person during a drug raid, said it is unrealistic to think there is anonymity when an officer pulls the trigger. Police unions seem to have two standards for disclosure, Ramsey said. "When the action of an officer is deemed to be heroic, there's not any pushback from the union on releasing a name," he said. In more than 30 shootings, departments contacted by The Post refused to release officers names as a matter of policy. In the District, police used to identify officers involved in fatal shootings, Ramsey said. That practice ended after Ramsey resigned from the D.C. department in 2006. "We never release the names of anybody involved in a shooting, not the officers, not witnesses, not suspects, unless they are deceased or charged with a crime," said Lt. Sean Conboy, a D.C. police spokesman. Conboy said that has always been the practice and that he is unaware of a time when the department disclosed officers' names. That policy has left Norma Shorter with unanswered questions. Norma Shorter, 63, is the great-aunt of Marquesha McMillan, 21, pictured left, who was fatally shot while allegedly trying to rob a Washington liquor store in 2015. The family does not dispute that McMillan was robbing the store but has questions about why she was riddled with bullets. Police say she shot at them. Shorter's great-niece Marquesha McMillan died in October in a shootout with police after she and a male companion allegedly tried to rob Morris Miller Wines and Liquors in Northwest Washington. Police said that when they arrived, McMillan, 21, began shooting at officers, reloading her gun twice. Officers returned fire, killing her. Her accomplice was arrested and slapped with federal robbery and gun charges. 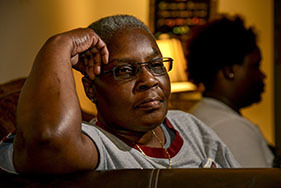 Shorter, 63, said she is struggling to understand how her great-niece - a once-diligent college student and star basketball player - ended up in a gunfight with police. When McMillan died, Shorter said, she was nearly halfway through a degree in exercise science at the University of Maryland Eastern Shore but had stopped classes and was working part time as a custodian at FedEx Field in Landover. Shorter said that a week after the shooting, she visited the police station in the district where McMillan died and asked for a meeting with the commander. She told police that she wanted to find out whether the officers involved had a history of using deadly force. After she waited for a half-hour, she said, a desk officer told her that nobody would meet with her. "I asked, 'When will you know something?' " Shorter recalled. "They said, 'Ma'am, we can't tell you that.' "
Shorter, who works for the federal agency that oversees probationers and parolees, said she does not blame the officers for reacting at the scene of the shooting but wants to know whether they could have avoided killing her great-niece. "We haven't even found out how many officers it was," she said. "If I were to find out anything, it would make me feel better." In Wichita, Santiago Quintero waited for more than a year before learning the name of the officer who shot and killed his son John Paul Quintero in January 2015. On the night he was shot, John Paul had been drinking and celebrating his 23rd birthday at his home when he got into a fight with another man. Santiago Quintero called 911, telling the operator that both men were brandishing knives. By the time police arrived, Quintero and John Paul were sitting in a Chevrolet Tahoe talking. Police ordered them out of the vehicle. Santiago Quintero said he yelled to police that the two were unarmed. John Paul was belligerent, police said, and an officer attempted to subdue him with a Taser. Police said John Paul was reaching for his waistband when an officer then shot him twice with her patrol rifle. Quintero disputes the account, saying his son was shot almost immediately after being shocked with the Taser. "My son had his hands up," Quintero said. "He had no weapon." The FBI has been investigating the case, according to the Sedgwick County district attorney. Wichita police do not release the names of officers involved in "critical incidents" except at the police chief's discretion, according to the department's published policy. Four months after the family filed suit over the shooting, the officer's name was included in documents the family obtained as part of litigation, according to the family's lawyer. In 1994, when Wichita released the names of two officers after a fatal shooting, one of the officers sued the city. the police department had violated its own policy. Fettke lost the case when the Kansas Supreme Court ruled that the city had no obligation to withhold his name. "As officers, we choose to sacrifice our daily existence to keep people safe," Fettke recently told The Post. "We're looking for a little protection back in our own direction." A credible threat against officers involved in a fatal shooting can be a strong argument against releasing their names. In more than a dozen cases, departments told The Post they would not release officers' names because of safety concerns. California generally requires departments to disclose the names, but the law provides an exemption: Police must show that an officer's life would be endangered. In a 2014 ruling, the California Supreme Court said that in shootings by police, "the balance tips strongly in favor of identity disclosure." the names, but before it did, the Long Beach police union asked a judge to intervene. The California Supreme Court ultimately said police departments should release names unless they can show "particularized" threats against officers. In Oakland, Demouria Hogg's family has been fighting for more than nine months to get police to tell them who shot and killed the 30-year-old father of three last summer. The shooting occurred on the morning of June 6 after Hogg was seen unconscious in a BMW parked on a highway offramp. Police called to the scene said they saw a handgun on the passenger seat next to Hogg. Officers said they tried for an hour to wake Hogg, eventually smashing the passenger side window with a metal pipe. When Hogg awoke, one officer shocked him with a Taser, and the other fatally shot him, police said. Hogg's family filed a federal civil rights lawsuit in October. In Hogg's case, the department is not releasing the names "due to receiving verified, credible threats against the officers," Officer Marco Marquez, a spokesman for the department, told The Post. In West Virginia, the Monongalia County Sheriff's Office would not tell Christie Cathers's family who fired into her car and killed her in June 2015 because people had threatened the deputies on social media, the sheriff said. The shooting happened after the 45-year-old mother of three disappeared from her home in Morgantown. Her husband told emergency dispatchers that his wife might be having a mental breakdown. There were reports that Cathers had brandished a knife. Deputies soon found Cathers's Dodge Avenger and pulled her over. They approached her car on foot, but she drove toward them. One deputy jumped out of her way while another fired into her vehicle but missed her. After a brief car chase, a deputy caught up with her again and opened fire as she drove past, striking her in the head and killing her, according to police news releases and a lawsuit filed by her family. In November a grand jury found that the shooting was justified. Lawyers for the family said they were able to discover the names of the deputies involved, but Sheriff Kenneth "Al" Kisner said the family is speculating. "I know they did not get any information from our department," Kisner said. Monongalia County reveals officers' identities on a case-by-case basis, he said. Greg Farmerie, the father of Cathers's children, said in a statement to The Post: "My kids, Christie's husband and her family, as a whole, deserve a better, more transparent process." In the only other fatal shooting by the sheriff's department in 2015, Kisner has not identified the deputy who killed David Romanoski in November as officers served a search warrant. Police unions have been a powerful voice against releasing the names of officers in fatal shootings. In Chicago, police in 2015 shot and killed nine people. The department has not publicly identified any of the officers, who are covered by the collective bargaining agreement with the union. The contract prohibits the department from identifying an officer to the media unless the shooting results in criminal or administrative charges. An officer who killed two people in one shooting disclosed his own name when he sued the estate of one of those he killed, citing emotional trauma. The department disclosed the name of a police commander involved in a third shooting because he is not protected by the union contract. The department withheld the name of another officer involved in the same shooting. "Just because an officer is involved in a fatal shooting doesn't mean that the officer has done anything outside of protecting their own life and the life of their partners," Dean C. Angelo Sr., president of the Fraternal Order of Police Chicago Lodge No. 7, told The Post. Chicago police have refused to identify the officers publicly, even as activists and others have demanded greater police accountability after the October 2014 fatal shooting of Laquan McDonald, a 17-year-old African American armed with a knife. In November, police released video of an officer shooting McDonald 16 times as the teen was walking away. Hours earlier, prosecutors named Officer Jason Van Dyke when they filed a murder charge against him in the fatal shooting. In the following weeks, protests brought the city to a standstill. "The political backlash from the city's decision resulted in my client being improperly charged. This was a tragedy, not a murder," said Dan Herbert, Van Dyke's attorney. In December, Mayor Rahm Emanuel (D) fired the police superintendent, saying public trust in the department had "eroded." He also vowed to implement reforms that would make the department more transparent. Emanuel declined to comment. The mayor's promise has made no difference for Pamela Anderson, 52, who said she still does not know the name of the Chicago officer who killed her son at their home in September. Her adult son James lived with her and struggled with his mental illness, she said. He enjoyed spending time in his room watching "Soul Train," listening to Run DMC and eating noodles, she said. He had never used drugs or been in jail, she said. Anderson said she called an emergency dispatcher when her son stopped cleaning himself and had become increasingly confused. She told the dispatcher that her son had threatened her, was mentally ill and needed to go to the hospital. The dispatcher asked whether her son was armed. She told the dispatcher that James had a box cutter in his pocket but would not use it. "You don't need to come here with no guns or nothing," she told the dispatcher, according to a transcript of the call. It was not the first time Anderson had made such a call. James had lived with her in Chicago's Humboldt Park neighborhood for more than two years. On at least five occasions, emergency workers had come to their apartment to assist him when he had stopped taking his medication or was neglecting his personal hygiene. He would always go to the hospital without a struggle, Anderson said. James was in his bedroom listening to music when officers arrived that September night, according to a lawsuit Anderson has filed over his death. Officers met Anderson on her porch, where she told them James had no history of violence. One officer, with his gun drawn, knocked on James's bedroom door, the suit states. Anderson contends that she pleaded with the officer to put his gun away, telling him that James was not a danger. Police said James emerged from his room holding the box cutter and approached in a threatening manner. Officers said that they used a Taser on him but that it had no effect. Police said James moved toward them, and one officer opened fire, killing him. Anderson said James had nothing in his hands and that he was shot seven times. "I don't want to be mean to him. I want to know what was on his mind," Anderson said of the officer who shot her son. "I want to talk to him." Steven Rich, Julie Tate, Jennifer Jenkins, John Muyskens and Peter Hermann contributed to this report. This article was produced in partnership with the Investigative Reporting Workshop at American University, where Derek Hawkins, Kate McCormick and Ashley Balcerzak are students. Students Karol Anne M. Ilagan, Andrew Kreighbaum and Samantha Hogan also contributed to this report.